It’s relatively unusual for a religious private college to have a football team. While George Fox, Missouri Baptist, and Southeastern are among the most recent of the 270 NCAA football programs to have started in the last thirty-five years, it appears that about three in five schools in the Council for Christian Colleges & Universities do not have football teams, including Calvin, Gordon, Goshen, Messiah, Seattle Pacific, and Westmont. (Ditto Union and Oklahoma Wesleyan — the two institutions that recently left the CCCU.) I suspect that cost and Title IX are the main factors here, though there might well be theological or cultural reasons in some cases. So as a sports fan, I feel fortunate that I could take my family to the home football opener at Bethel University last weekend. While perhaps best known at the moment for some laugh-out-loud-funny roster pictures, the Royals are a consistently strong team, often contending for the championship of the Minnesota Intercollegiate Athletic Conference against Bethel’s much larger rival, the University of St. Thomas. Bethel dropped to 1-1 after losing to their cross-border rivals from Wartburg College. (Just after Thanksgiving 2013, Bethel won a terrific game in the second round of the NCAA Division III playoffs, then lost its opener to the Knights last year in Iowa.) But whatever their record this year, I know head coach Steve Johnson and his staff well enough to know that they are even more committed to forming character and building community than to winning games. I’m sure that, for many of hundred or so student-athletes on this year’s roster, their time on the football team will play a big role in moving them towards the “whole and holy persons” ideal that we talk about all the time at Bethel. But another moment tainted my memory of the afternoon. With the Royals failing to take advantage of two Wartburg turnovers in the red zone, our entire section of the stands had to listen to a Royals Knights assistant coach, stationed in the press box, screaming profanities at the top of his lungs into his headset. 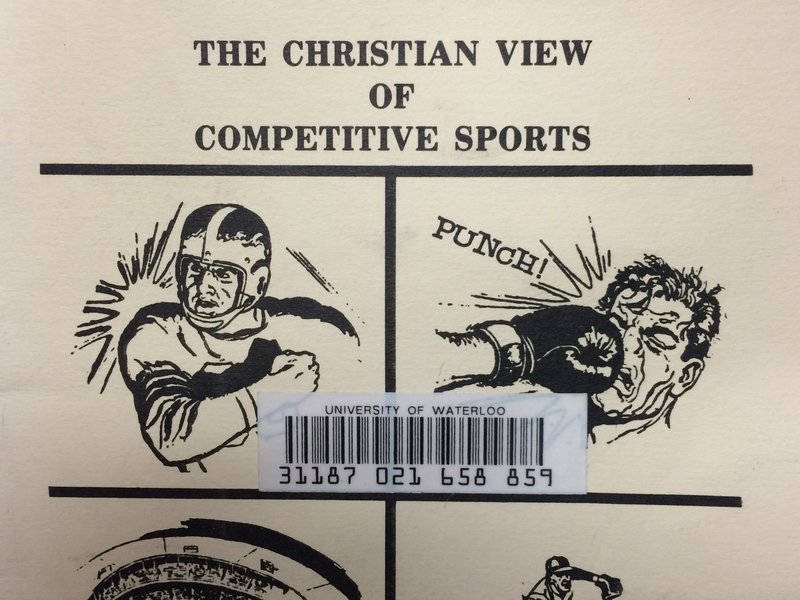 In my post on Anabaptist views of sports last week, I mentioned a 1988 pamphlet by a conservative Mennonite named Ronald Border. It’s easy to dismiss a work whose first page asserts that “The pre-occupation with sports… is an indication of a spiritual void in hearts which can only be fully satisfied with the presence of Jesus.” But while I believe that the example of coaches and athletes like those at schools like Bethel demonstrate that love of sports and love of God are not mutually exclusive, I do think Border points to some problems that most mainstream Christians gloss over too easily. Whether or not it’s fair to say that those of us who play and watch competitive sports are among “the unsuspecting, the unknowing, and the willfully short-sighted,” Border’s not entirely wrong to argue that our innate desires to be “totally dedicated to something,” to be part of a community, and to engage in practices that foster personal development can be misdirected by sports. Rather than dedicating ourselves to God, for example, we can make an idol out of any sport. Border doesn’t focus solely on players. There’s a whole section on the problem of Christians participating as spectators. But he thinks that athletes “have misinterpreted this yearning [for dedication to God] and have offered their ‘last full measure of devotion’ (their lives) on the battlefield or in the sports arena.” Not only are they then tempted to sacrifice themselves for the sake of praise, glory, fame, and (especially) money, but they risk physical and psychological danger. Of course, this isn’t unique to football. But I do think there’s reason to have special concern about that particular sport as it’s played professionally and at the highest levels of intercollegiate competition. Borland has consistently described his retirement as a pre-emptive strike to (hopefully) preserve his mental health. “If there were no possibility of brain damage, I’d still be playing,” he says. But buried deeper in his message are ideas perhaps even more threatening to the NFL and our embattled national sport. It’s not just that Borland won’t play football anymore. He’s reluctant to even watch it, he now says, so disturbed is he by its inherent violence, the extreme measures that are required to stay on the field at the highest levels and the physical destruction he has witnessed to people he loves and admires — especially to their brains. Borland has complicated, even tortured, feelings about football that grow deeper the more removed he is from the game. He still sees it as an exhilarating sport that cultivates discipline and teamwork and brings communities and families together. “I don’t dislike football,” he insists. “I love football.” At the same time, he has come to view it as a dehumanizing spectacle that debases both the people who play it and the people who watch it. “Dehumanizing” does sound extreme. I think that, at the level of Division III and the NAIA (where most Christian colleges play), the spectacle is so much more muted and the competition so much less heated that football can instead help humans to flourish, rather than debase them. But if I take the remembered sound and sight of one D3 assistant coach giving in for a few seconds to his ugliest emotions, and then magnify it by a factor of thousands… I think I’d have a clear sense of what the upper echelon of college football — to say nothing of pro football — can be like. In such economies and such cultures, I think it’s an open question whether avowedly Christian institutions ought to be participating in a brand of football that risks dehumanizing or debasing those who participate in it — or tempts institutions to compromise their convictions for the sake of competitive success. It would be generous to say the school was in denial. It probably would be more accurate to say that, just as it has at other Big 12 schools, football has gotten too big at Baylor. And I hope my fellow Baylor alums are as troubled about that as I am. So if success on the gridiron is inextricably linked with claims about the Christian identity of the university, what happens when that athletic program itself seems to enable, if not encourage, such unchristian behavior? But it’s at moments of crises like this one when people discover how a university, and its president, prioritizes athletics. Baylor, a Baptist school that professes to adhere to Christian principles, appears to have “sheltered” a “perpetrator,” to use [Baylor president Ken] Starr’s own words, because this particular perp might be able to help the team win a few games. It happens way too often. I’m leery of pushing too hard here. I’ve seen — and previously written about — the educational benefits of sports at schools like Bethel. What I’d heard of Art Briles before this summer was only positive. But as we enter what ESPN Radio host Mike Greenberg this morning predicted would be “a magnificent weekend of college football,” I wonder if readers agree that there’s a level (the Football Bowl Series subdivision? lower?) at which the cost of sustaining such magnificence requires a Christian university to run an unacceptably high risk of compromising its mission and values.